Through assuring quality, fair pricing and finely-tuned purchasing and delivery system, Chan Man Lee has become the trusted partner for an expanding list of quality product brands such as Dormer, Triangle, Volkel, V-Coil, Presto, Jacobs, Tapmatic, Pferd, Hunter, Eclipse, Taylor & Jones and many more. 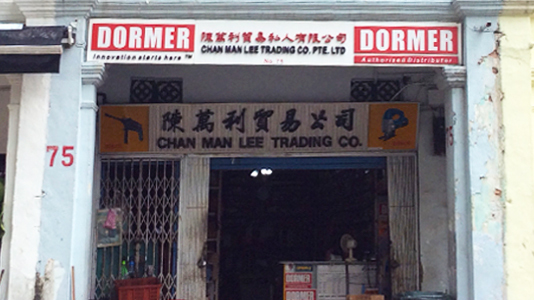 Chan Man Lee is your choice supplier for: Hand Tools/ Precision Tools, Cutting Tools, Threading Tools, Drilling Chucks, Abrasive Tools, Stencils & Punches and Engineering Tools. Catering to the exacting needs of businesses in the industrial engineering and shipbuilding industries, Chan Man Lee’s strong commitment to quality products and services with cumulated experience that spans over 50 years has fortified its choice supplier position offering wide-ranging brands from Germany, UK, USA, Italy, Spain, China and India. Today Chan Man Lee is poised to take on the ever-changing business landscape and needs of its clients, with the passing of its management baton to the 2nd generation. With a staff strength into the twenties and an expanding fleet of vehicles for local deliveries, Chan Man Lee is confident that together with its perennial inventory and sales system renewal and staff training, its clients would enjoy increasing value-added returns going forward.